The high pace of technological innovations in cardiac CT has extended its reach to the evaluation of ischemic cardiomyopathy, enabling pharmacological stress myocardial CT perfusion imaging. 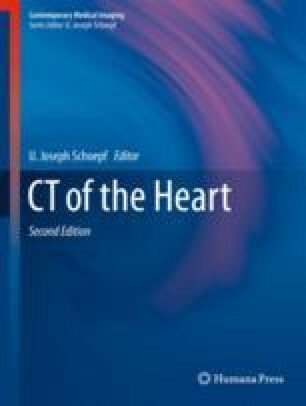 This extension promises to cover one of the traditionally weaker flanks of cardiac CT: the specificity and positive predictive value in the detection of hemodynamically significant stenoses. Furthermore, diagnostic accuracy in the assessment of stent patency and severely calcified coronary trees may be increased. Future clinical studies will have to address the differences between static and dynamic acquisition protocols, as the former cannot provide fully quantitative data but come at considerably lower radiation doses.